I'm embracing my darker side this year and participating in Smeared and Smudged forum's annual 12 Days of Creepmas blog hop as a Jolly Blogger! 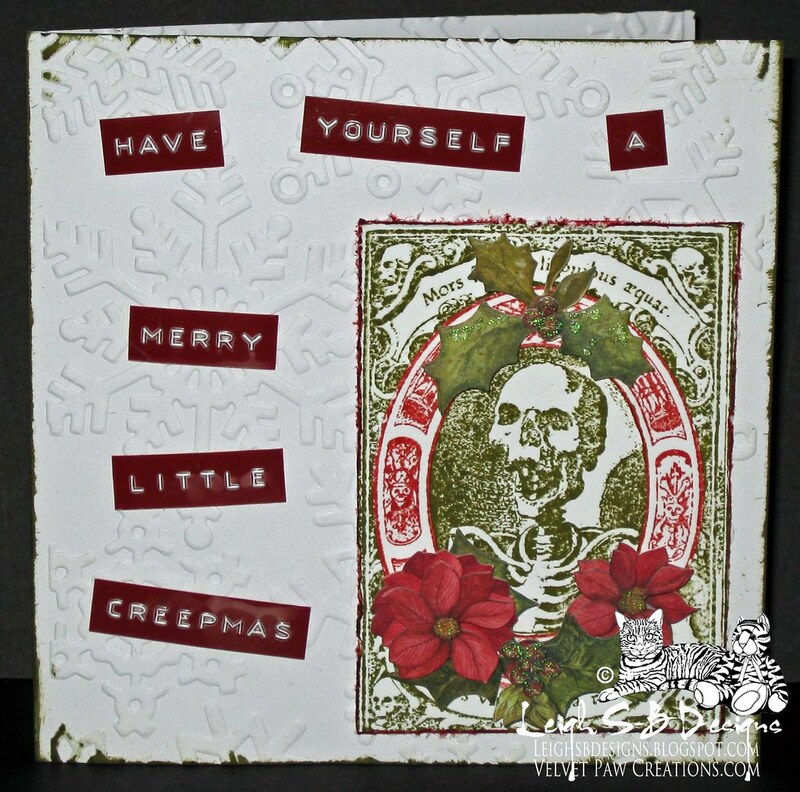 I missed Day 1 coz I had surgery on Nov 30 so here's my Day 2 contribution and the blog hop roll is below if you want to hop along and see more Creepmas creations by my fellow Jolly Bloggers! Today is Smeared Ink Day too which means we are challenged to use only Smeared Ink images in our creations! 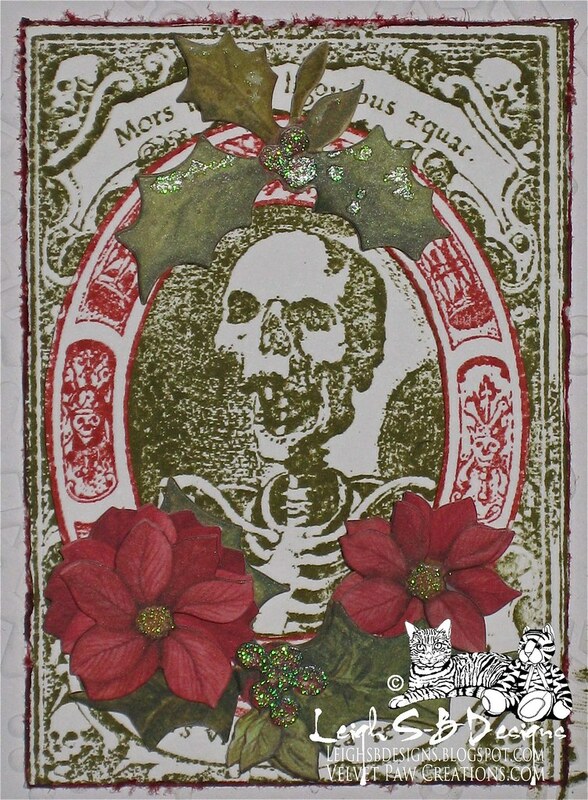 So I used Smeared Inks' 'Plaque - As Death' image and created this Creepmas wreath card. I stamped the image twice onto white cardstock. First in Forest Moss Distress Ink and then in Fired Brick Distress Ink and cut out the oval part of the red image to create the wreath frame which was then layered onto the green panel with mini pop dots. I distressed the green panel with Tim's paper distresser tool and edged it with Fired Brick Distress Ink. I embossed a square white folded card with a snowflake embossing folder by Cuttlebug and added Forest Moss Distress Ink to the edges. 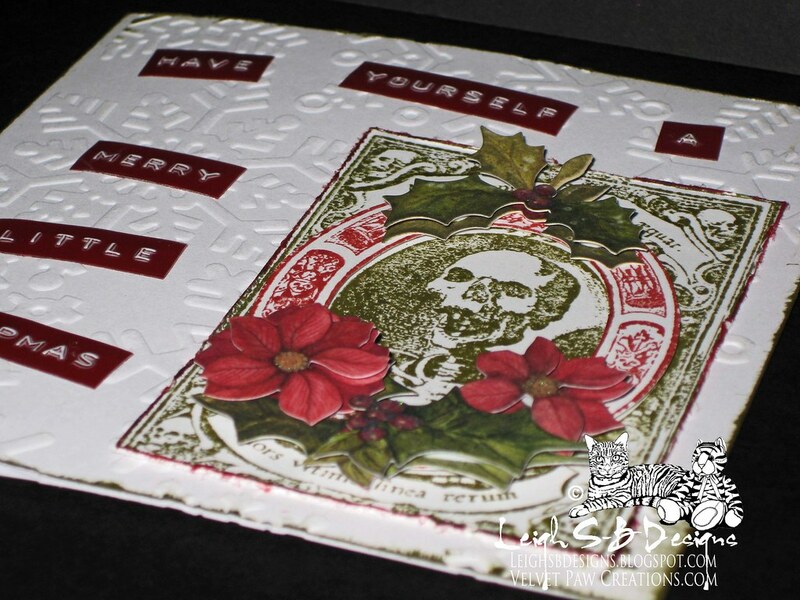 Then adhered the stamped image to the card and embellished with it with K&Company dimensional holly and poinsettias. For my sentiment I used a Dymo Buddy label maker with red tape to complete my card. So glad you're feeling well enough to craft! Other things too but we all know what's important! I love the whole project immensely but really enjoyed seeing how you used two stamped images to create one! Leigh love your card. Love that SI stamp (I have it in digital and it is one of my favorites). Glad you could join in to day...hope that means you are feeling better! Too cool- love how you created the wreath effect with two colors. I need that image now! Bwahahahaha! That's hilarious, Leigh! I LOVE it! It fits perfect if you ask me :) great job! and hope you get well soon. Lovely card, love the snowflake background and the red and green. Perfect idea to add the poinsettias to the image. Glad to see you are feeling better... LOVE the card. That is one of my fav images. Thanx for sharing! Awesome card. Thanks for playing with us at RSD Challenge Blog.